Okay, I get it, I should have know better but they dangled Jeff Goldblum out in front of me and like a stupid fish in a pay pond I bit again. I bit down hard only to find out that Goldblum has the smallest role ever and the entire movie was an exercise in how to trick idiots into spending their money, this feeling has to be similar to what the fish feel in a pay pond. The worst thing about it is that in two years they'll probably dangle Sam Neill out there and catch me again.... Damn do I feel like an idiot. Whatever. This movie has no redeeming value at all except for a Pachy that runs around ramming people in a small crowded area. 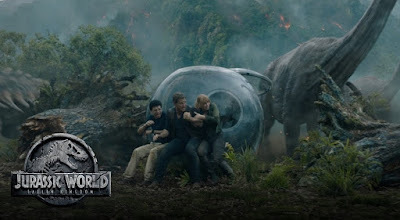 The CGI is so bloated and overdone that the one scene featuring a physical T-Rex failed to entertain because it became lost in the sea of nonsense. When you make a movie called Jurassic World I expect dinosaurs to be featured heavily in the story and by that I mean real ones. Not these man made Indo breeds that have now been feature twice as the bad guy (animal). Dinosaurs are scary enough that you don't have to make up new ones. This is a movie you agree to make when you are getting a divorce and know that you have to cut some big checks in the coming months. Yea, Chris Pratt, it shows on screen when you do something for a paycheck. That goes for you too Ron Howard's daughter (I honestly can't remember her name and I'm to lazy to switch tabs and google it). I think it's safe to blame everyone who worked on this film as the downfall here. Poor acting, poor writing... No atrocious writing, inexcusable plot and an overall product that is half baked and tastes like a shitcicle. Please save your money and do not see this travesty of a movie. I can't believe I'm saying this but go see Ocean's 8. Seriously, it's better than it has any right to be. Or see anything else that is not Jurassic World: Fallen Kingdom.... Maybe just save your money. Also any half-assed journalist who gives this movie a good review is a shill and did so for a paycheck or they are even dumber than I am and thought a minute of Goldblum was worth the price of admission.